Mendocino is a picturesque collection of Victorian villages residing along rugged coastlines, sprawling vineyards, and towering redwood forests, that welcomes those that prefer the scenic path. More fun things to do? Check out the TOP 10 Things to Do. Mendocino County is in Northern California, just a few hours above San Francisco. The most popular ways to get to Mendocino are from HWY 101, (from the South) is HWY 128, through our picturesque Mendocino Wine Country over rolling hills and towering redwood forests -or- (from the North) use HWY 20 West, to the coast into Fort Bragg. HWY 1 hugs the coast, it takes a little longer, but the views are spectacular! CLICK ANY PHOTO FOR MORE INFORMATION! Stroll through these quaint seaside towns and you'll discover many fun things to do! Just steps from your Mendocino B&B you'll find charming restaurants, unique boutiques, galleries specializing in local art, and lively entertainment. Glass Beach is an unique "Must See" that the kids will love! Many years ago there was a trash deposit in this cove where Elm Street meets the ocean. It's been gone for a long time, but what remains at the waters edge are lots of pieces of rounded ocean glass. The ocean waves splash on beautiful rocks in the water and it's a wonderful place to watch the sunset. 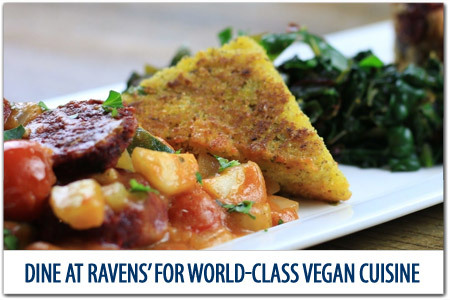 Chances are, you have never seen anything like it, and it is relatively easy to get to. 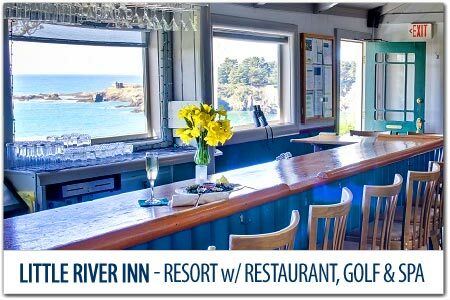 The Mendocino Coast offers the ideal backdrop for an elegant coastal wedding. Some of the most popular locations for Mendocino weddings are oceanfront bluffs, Victorian gardens, under the redwoods or in a picturesque vineyard! 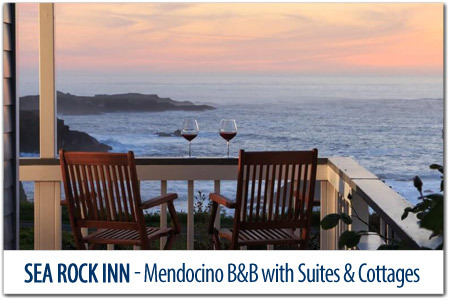 Some of our Mendocino Inns specialize in all inclusive Mendocino weddings, offering wedding, reception, honeymoon and guest lodging all in one place! 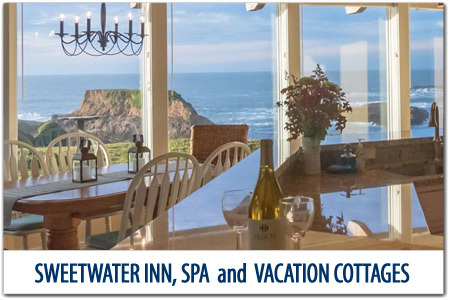 Consider returning to one of our romantic Inns of Mendocino on your anniversary to fall in love again, with each other and the romantic Mendocino Coast! Mendocino is best known for spectacular scenery, seaside Victorian villages and distinctive wineries, although most people come to Mendocino to getaway and relax. 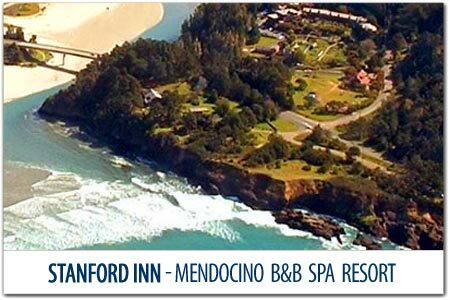 The majority of our Mendocino Hotels put a large emphasis on pampering their guests! Most offer scrumptious breakfasts, some even in bed, others offer a rejuvenating massage in a luxurious Day Spa. 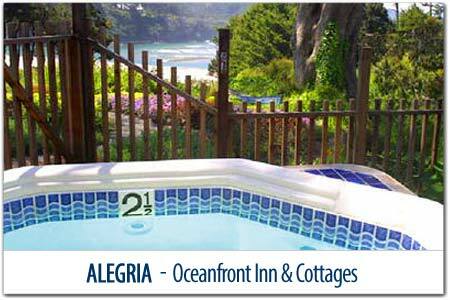 Enjoy your stay in one of our romantic Mendocino Inns to unwind for a few days, you'll both be glad you did. Coastal dispensaries are available. The combination of cool coastal breezes, warm days and the fertile soils of the Mendocino Wine Country help produce world-renowned award winning Mendocino wines. Spend a relaxing day wine tasting. 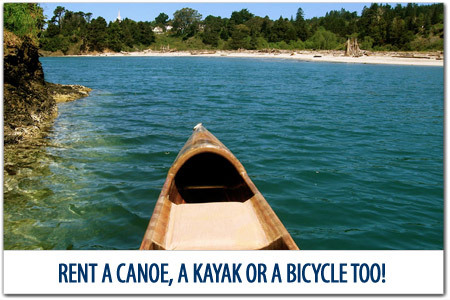 Any weekend can be a long weekend - Just treat yourself to an extra day in Mendocino! The coastal route on Hwy 1, also called Shoreline HWY, takes a little longer as you travel along the rugged coastline, but you gain spectacular ocean views and quaint seaside villages. The Mendocino County Line and South Coast of Mendocino, begins at Gualala and continues through Point Arena. To access the South Coast from the interior, take Hwy 128 toward the coast, from Hwy 101, then turn South on HWY 1. Albion and Elk straddle where Hwy 128 meets the sea. 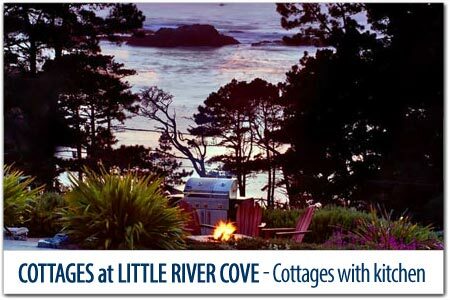 Heading north from Hwy 128 you'll discover Little River and Mendocino. The northern route to the coast from Hwy 101, is Hwy 20 west to Fort Bragg. Mendocino Village is surrounded on three sides by beautiful ocean bluffs, known as the Mendocino Headlands. 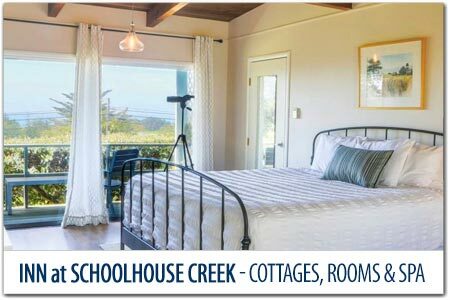 With walking trails that afford incredible views of the ocean and New England style Victorians that have been lovingly restored into romantic Mendocino Bed and Breakfasts, specialty shops and Mendocino Vacation Rentals. Fans of "Murder She Wrote" will recognize this seaside village as "Cabot Cove". That's right, Murder She Wrote was filmed in the Village of Mendocino (Hollywood's version of Maine). See if you can spot the Homes in Mendocino that were portrayed as her home -or- "the scene of the crime". Mendocino is the only town on the California Coast that is designated as an Historical Landmark. Established in the 1850's, the architecture is reminiscent of Maine with its grand Victorians and quaint Saltbox cottages. Flowers grow lush and many of the Mendocino hotels offer beautiful gardens to enjoy. Mendocino is a photographers paradise, everywhere you look there is another picture postcard waiting to be snapped. From crashing waves and old-fashioned water towers to flower covered picket fences and deserted sandy beaches - just some of the magic that awaits you in Historic Mendocino. There is one very tall reason why the Mendocino Coast looks they way it does. It's the Redwoods, the area was discovered and settled to harvest the redwoods that built San Francisco. The quaint seaside village of Elk is the best-kept secret only 30 minutes south of Mendocino and well worth the trip. This sleepy picturesque village is perfect for getting closer and getting away together. 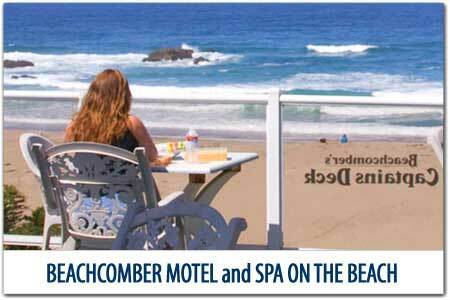 Treat yourself to an oceanfront Bed and Breakfast Inn along Elk's Coast. 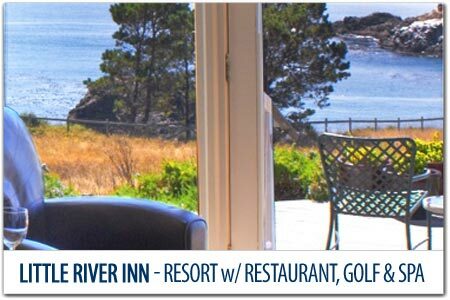 Mendocino Inns on the Mendocino Coast surround their guests with breathtaking Mendocino ocean views that are truly inspiring. Albion is a small fishing village with lodging, restaurants and scenic vistas. The historic Albion River Bridge, was built in 1944 and is the last wooden bridge in operation along Highway 1. It was constructed from salvaged wood during World War II, when steel and concrete were in short supply. 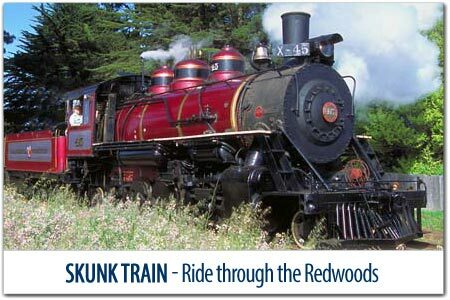 On The Southern Mendocino County line, you'll find the quaint little town of Gualala. Some people call it gwa-LA-la, but the old-timers call it wa-LA-la. Said to come from the Kashaya Pomo Indian phrase, "ah kha wa la lee" which means, "Where the water flows down", named for the river that flows out to the ocean right across from the center of town. Point Arena was one of the first lighthouses built on the California coast and definitely one of the prettiest. The 1906 earthquake nearly destroyed the original lighthouse. The rebuilt lighthouse is open daily for tours. Set in one of the most spectacular, yet peaceful surroundings on the northern California coast, the Point Arena tower is the only Pacific West coast lighthouse of significant height (115 feet) that you can climb to the top! Mendocino Wine Country begins about 90 miles north of San Francisco in the inland valleys of Mendocino County. Due to the varied terrain and expansive range of micro-climates, the Mendocino wine growing region is able to produce an impressive variety of grapes that create superior wines. The first vineyards were planted here in the early 1850's, beginning a rich tradition of World-Class Wines that continues to this day. Nearly 40 wineries are located in three regions of Mendocino County - Redwood Valley - Ukiah, Hopland and Anderson Valley. Redwood Valley - Ukiah and Hopland are both in the Russian River area of the County. In addition, the western most winery on the continental United States is on the Mendocino Coast that showcases a winery tasting room at the oceans edge. Combined with the unparalleled views of wide-open spaces with redwood trees and rolling meadows to the ocean bluffs, the Mendocino Coast is a wonderful way to spend a weekend relaxing in your RV at a local campground, Mendocino County Lodging or asking your honey to "Marry Me in Mendocino". Perhaps, you prefer to live on the edge, let us help you find a Mendocino Beach House. 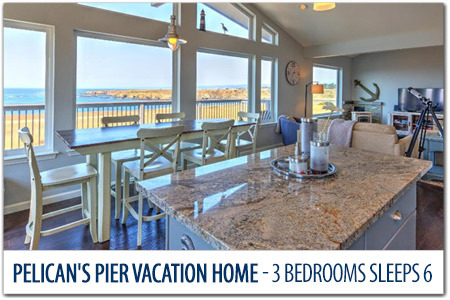 Renting a Mendocino Vacation Rental Home is popular with families and couples that want a private family atmosphere with more amenities; such as a kitchen, separate bedrooms, private hot tub, tv and beach access. 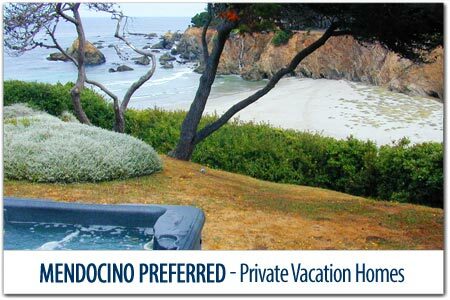 Mendocino Vacation Rentals are perfect for extended families attending a wedding or traveling together. 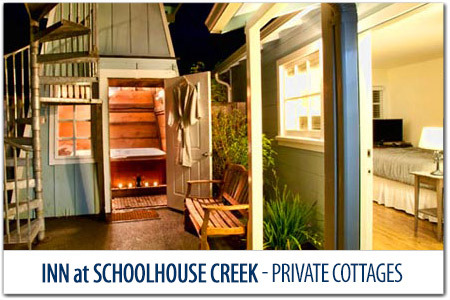 Many Mendocino Inns have private cottages on their property that make the perfect vacation rental. Mendocino enjoys a cool Maritime climate. Summer days can be cooled by fog, while daytime highs average in the upper sixties and lows in the fifties. Winters rarely, if ever, see frost or snow, thanks to the Pacific Ocean. Mendocino averages about 43 inches of rain per year concentrated mainly in fall, winter and spring. Wondering how to pack? 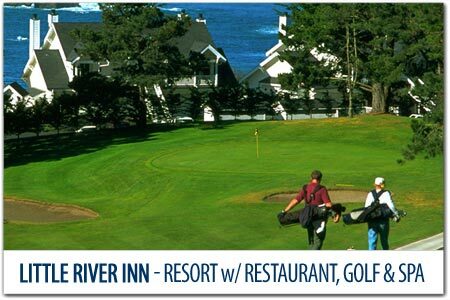 When looking amongst our impressive selection of Mendocino Hotels, try to shop for value! Golf courses are generally long stretches of grass with a few trees and a sand trap or two to make things interesting. But the oceanview Mendocino Golf Course has been awarded a top honor: already a Certified Audubon Cooperation Sanctuary Property, the Little River Golf Course was proclaimed the Winner of the Environmental Leaders in Golf Award (ELGA) announced by Golf Digest Magazine and the Golf Course Superintendents Association of America. Another unusual and interesting State Park awaits you, just turn East on Little River - Airport Road and follow the signs to the Pygmy Forest. The nutrient-poor, highly acidic clay hardpan soil is relatively inhospitable. As a result, the trees are dwarfed, some mature trees are barely waist-high even though they are hundreds of years old just like the towering redwoods in the middle of the park.